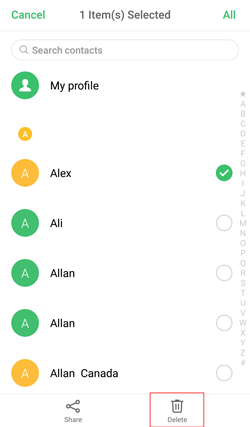 Various scenarios make users delete contacts from their Android devices. Some of the reasons why users delete contacts from their phones include somebody not in communication for a prolonged period, when you sell your phone to a third-party when your phone has thousands of contacts that make it slow down, among others. With this, your biggest worry is probably how to delete contacts on Android. Deleting contacts from your Android gadget is a walk in the park. > Go to the Contacts application. > Search for the contact that you want to delete. > Press and hold that contact for a few seconds (you can do this for the other contacts when deleting more than one). > Tap on the "Delete" option that pops up. > Click "OK" to confirm your selection. It is advised to avoid using this method when deleting contacts because your contacts are not entirely erased. Retrieving the deleted contacts with various data recovery software is possible. > It backups and restores entire Android data with a single click. > The restored data is 100% original. 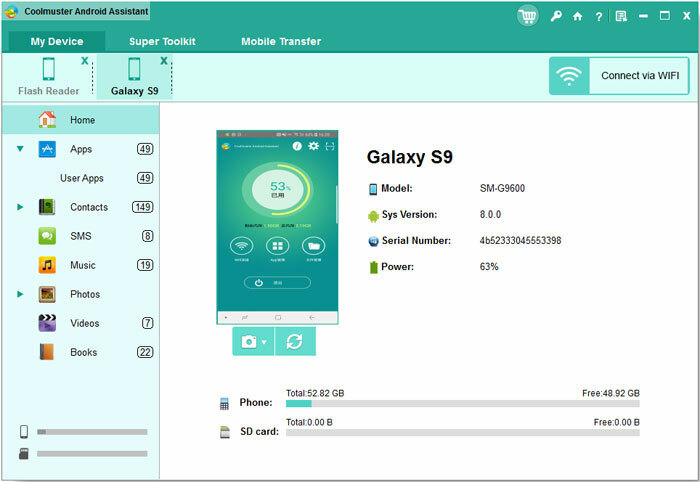 > It allows the transfer of SMS, contacts, music, call logs, pictures, videos, among other files between your phone and computer. > It allows one to add, erase, backup, unduplicate as well as edit contacts via computer. > It supports to send and reply SMS directly on PC. > It installs and uninstalls applications from PC. > It imports, exports, and deletes Android call logs. > It imports and exports contacts from Outlook. > It is fully compatible with almost all Android phones & tablets, including Samsung (Galaxy S9/S9 Plus/Note 9/Note 9 Plus included), Huawei, HTC, LG, Xiaomi, Motorola, ZTE, etc. - Connect your phone to PC via a working USB. - Enable USB debugging mode on your phone. - You can also opt to connect your phone via Wi-Fi. 1. From the left side-bar, select the "Contacts" icon. 2. Tap "Delete" button to delete the unwanted contacts from your Android phone. 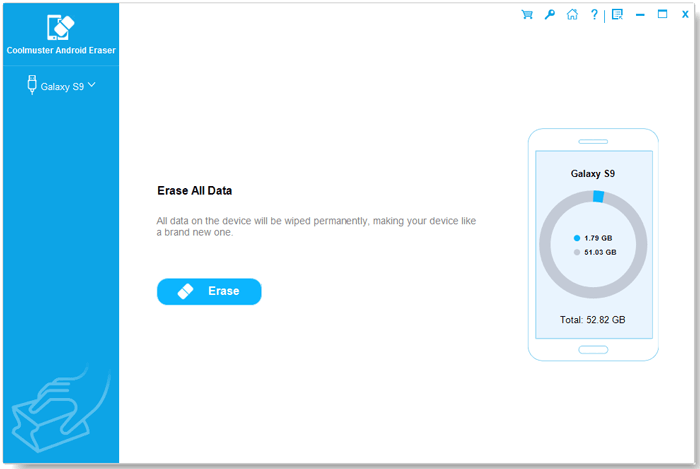 > It wipes data such as private data, deleted files, as well as system Settings from your Android device permanently. > It supports all types of Android files, including contacts, SMS, photos, call logs, images, books, account info, audios, and passwords. > It supports 100% permanent deletion and prevents personal data from being retrieved. > It works in all types of Android devices from Android 2.0 - Android 9.0 or later. Notes: Before using this program to delete your contacts, it is essential to ensure that you have backed up your important data on Android phone and also the program recognizes your phone. After deleting, all contacts will be deleted entirely with zero chances of retrieval. Also, do not disconnect your phone before the entire process finishes. First Step: Tap "Erase" button to start. After connecting your phone successfully, you will get into the primary interface. Tap on the "Erase" button to get started. 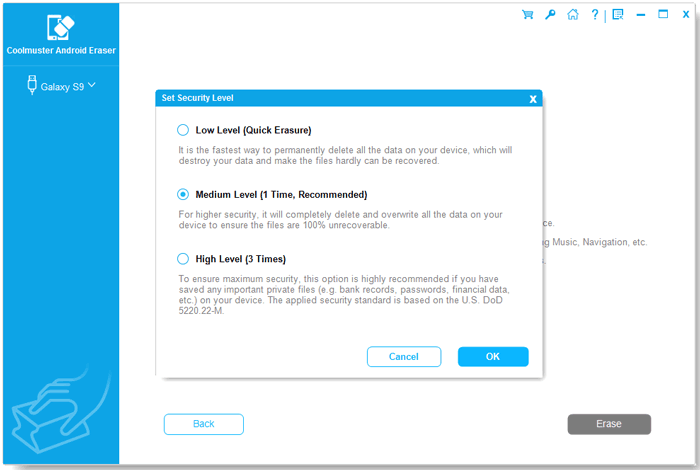 Second Step: Select your Security level for deleting and confirm. > Tap the menu next to the security level to select your security level for deleting. > Select the desired level (either High Level, Medium Level, or Low Level). > Click "OK" option after selecting. > Type "delete" onto the blank text box and confirm your selection, and then tap the "Erase" button. > On the pop-up window that asks you whether you want to erase, click "OK" to start the deletion process. > When a prompt window appears, click "Yes" on your device to delete the contacts entirely from your phone. 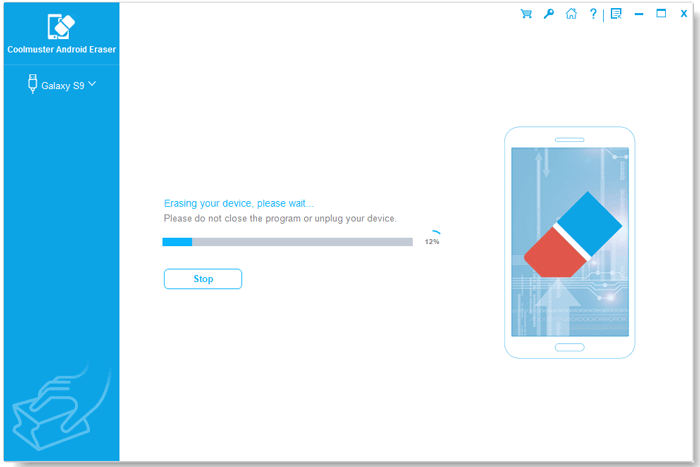 Third Step: Start to delete Android data permanently. > The program will perform a fast and deep scanning on your phone after confirming your choice. > The app will start the deletion process after the quick scan. Wait for a couple of minutes. > Your phone will be overwritten after the process completes. It is essential to select low-level security as it is the quickest way to delete any data on your phone. 1st Step: Startup WhatsApp on your Android gadget. Look for the contacts that you would want to delete from your WhatsApp contact page. 2nd Step: Click on the contact in order to access the contact information page. Tap the "Menu" button and then select "Show all contacts" or "View in address book" option. 3rd Step: Here, you will get the options to erase the contacts from the gadget's address book. 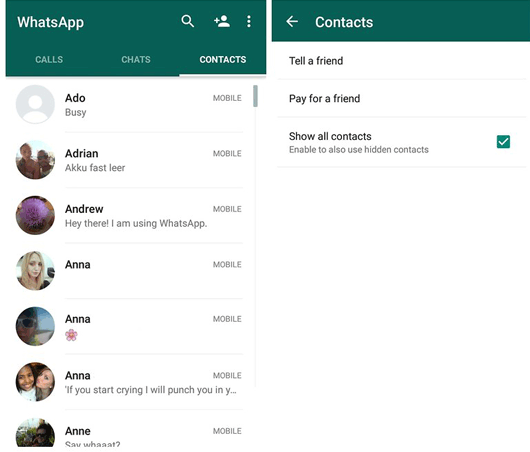 After deleting the contacts, you can refresh the WhatsApp contacts to check whether the contacts have been entirely removed. Can't Miss: 3 Methods to Recover Deleted WhatsApp Messages on Android? 1st Step: Go to Settings module from your phone. Choose the Facebook App and click it (Scroll down to find it). 2nd Step: Look for "Facebook Sync Settings." Uncheck the "Sync Contacts" option. Select "None." By doing this, you will be removing the synced contacts from your Android gadget. How to Sync Facebook Photos to Android Gallery? 1. Launch your web browser: Those that use Google Account to store contacts can consider using Google Contacts as it manages them more effectively. You can accomplish this from the official Google Contacts website. It is essential to note that this method only works for those contacts stored in Google Account. 2. From your browser, go to contacts.google.com. Sign in with similar credentials you use on your phone. 3. Click or tap the "Contacts" profile pictures to choose them. You can use the search address bar at the top of the page to search for the contacts quickly and easily. 4. Click or tap the Trashcan button which is located at the top of the screen. This action will erase the chosen contacts from your Google account. If you see a gray color on the trashcan, one or several chosen contacts were added to your contact list via Google+. You will be required to delete them from Google+ circles to erase them. 5. Click the Settings app from your Android. 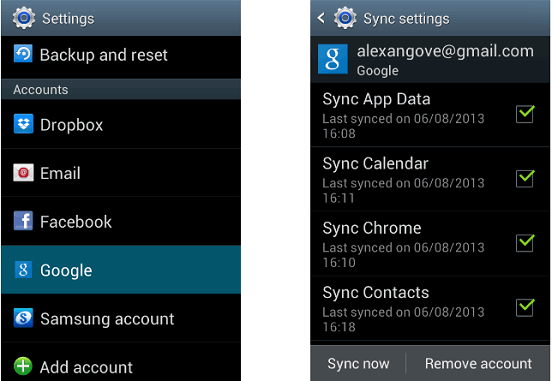 After erasing the contacts from the Google Contacts website, you will be forced to resync your account on your phone. 6. Click Accounts. You can get this under the "Personal" section. 7. Click "Google". You will be prompted to choose the account to modify if you have several Google Accounts. 8. Click the three-dot button. This is situated at the upper-right corner. 9. Click "Sync now". Your Google Account will resync your data including contacts. All contacts erased via the website will be deleted from your Android phone. The above methods not only show you how to delete all contacts from your Android device but also how to delete WhatsApp, Facebook, as well as Google contacts. 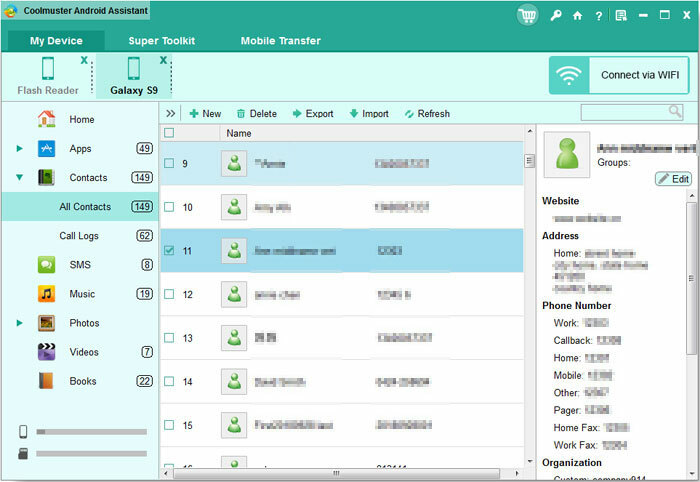 While all methods work, we strongly advise you to use Coolmuster Android Eraser and Coolmuster Android Assistant when it comes to deleting contacts from your phone. By utilizing these apps, you will be lessening chances of retrieving the deleted contacts completely. How to Transfer Contacts between Android and iPhone X/8/7/6?